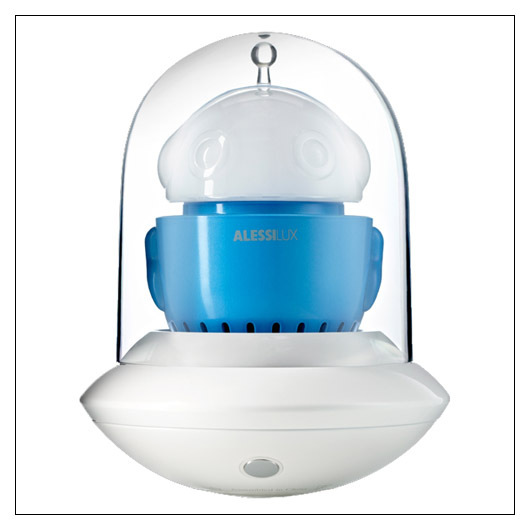 Foreverlamp/AlessiLux Lumiere UFO Lamp (ALFLUFO) at Pure Design Kids / Tots-n-Toddlers / Lighting ::: Kids' Toys, Furniture and More at Pure Design Kids! The Alessilux portable and rechargeable UFO Lumiere is designed by Gionvanni Alessi and Gabriele Chiave. This portable and rechargeable light is the perfect companion in dark places. Whether used for campsites, a patio evening or to solace a frightened youngster in a dark room Alessilux UFO Lumeires are convenient, perfect for the environmentally conscientious, and beautiful in modern design. It is light where you want it, when you want it and offers the ultimate freedom of placement. Will last up to 5 hours on a charge on full light output and up to 360 hours when dimmed. Runs on main power or battery. Continuous touch dimming goes from 1% to 100%. An energy saving "instant on" it is also perfect for mood lighting and the hospitality industry. Suitable for damp locations. Handle with Care. The main material is Polybycarbonate, which is the most durable type of plastic available. LED uses up to 80% less energy than standard incandescent sources. LED lasts 25 times longer and CO2 emissions are reduced by 80%. Light output is 100 lm which is equivalent to a 10 W standard lamp. Power consumption is 1.7 W. AC - 100~240 volts 50/60 Hz. Lifetime >20 years/40,000 hours. Switches 20,000 times. Works best at temp between -20 C and + 45C.